September 16, 2014 January 22, 2016 ErikRitterLeave a Comment on The Replacements teach Syllogisms! Major Premise: A sellout changes their original content or style for money. Minor premise: The Replacements didn’t change content or style. 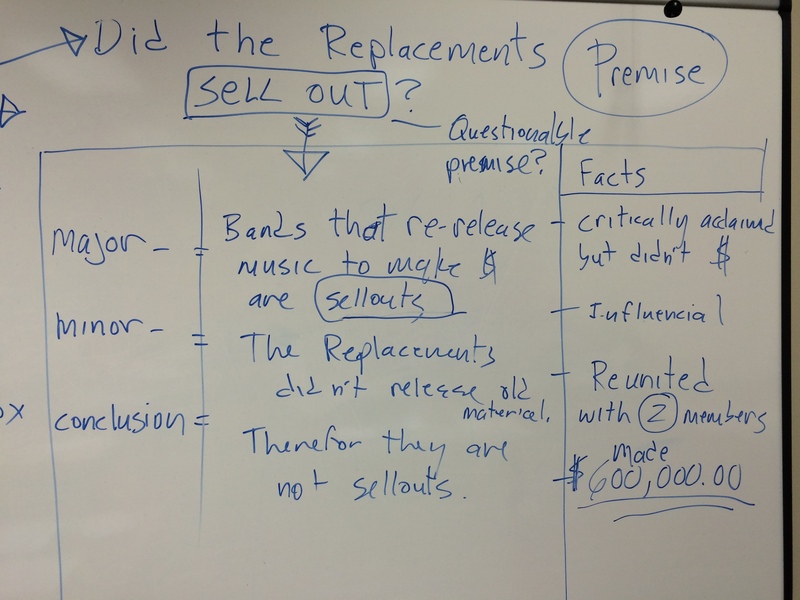 Conclusion: Therefore, The Replacements didn’t sellout out because they didn’t change. Major Premise: Bands that re-issue old music to make money are sellouts. Minor Premise: The Replacements didn’t release old material. 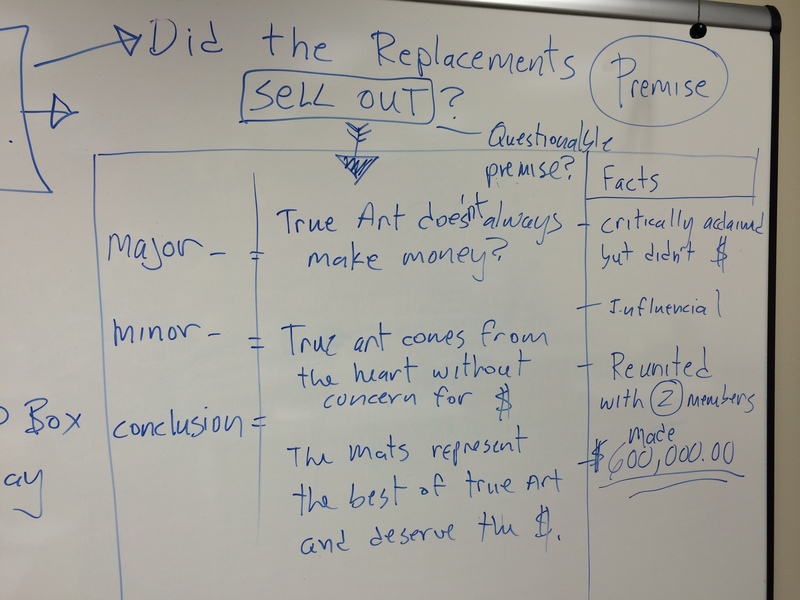 Conclusion: Therefore, The Replacements are not sellouts. Major Premise: True Art doesn’t always make money. Minor Premise: True Art comes from the heart and is not concerned with money. Conclusion: The Replacements represent the best of true art and deserve the money. Surprisingly the results were a good example on how emotional bias can distort logic. Student number three’s heart is certainly in the right place, but the logic is questionable. 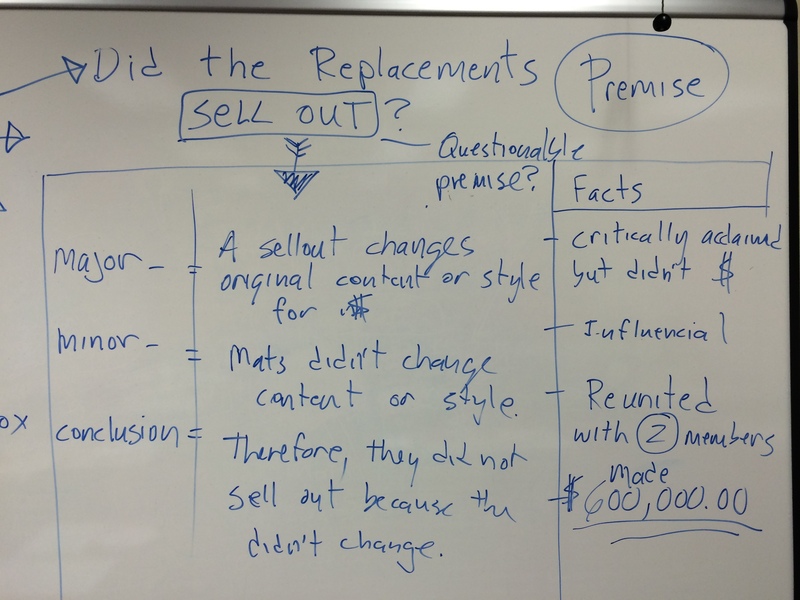 Most of the class recognized that the original premise “Are The Replacements sellouts?” contained the subjective concept of sellout, therefore making the original premise questionable. Regardless, It gave me a chance to indoctrinate my class with the Mats while teaching critical thinking skills and reviewing syllogisms. This sellout debate has gone on for decades, but was amplified by Neil Young’s “This Notes for You,” which won MTV’s Video of the Year in 1989. The Godfather of grunge, Young was the role model for Cobain, Vedder, and now Jack White. While Young was the patron saint of Grunge, the Mats were the prototype. The money grabs have changed since 1989, but some of the old school profiling remains. While lamenting a six figure deal with Chevy that he turned down, Steve Earl once said, “Neil Young has been a rich man since he was 19.” It’s pretty easy to turn down a money grab when you’ve got piles of it at home. This begs the question, what’s a sellout? I don’t care anymore, but Paul’s version of Skyway on the 12 string was amazing, don’t you think?